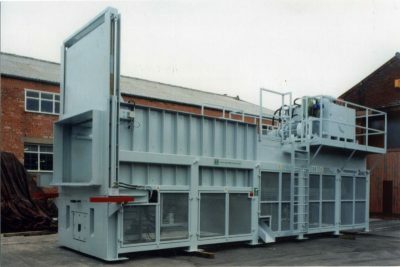 The Powerkrush 2000 is our largest sized Transfer Station with a capability of handling 507 cubic metres per hour of waste with a swept volume of 7.76 cubic metres, making this powerful compactor a natural choice in the design of high volume Refuse Transfer Stations. This extremely powerful compactor is capable of transfer loading huge amounts of waste material quickly and efficiently into the largest of bulk containers. Massive sections are used throughout to ensure that no distortion takes place during the compaction process. The compaction ram penetrates the container by 750mm to ensure maximum compaction and eliminating spill-back. Automatic high-pressure tamping is included in the design to assist in ease of container changeover. To find out more information, please contact our specialist team today!